No mother should ever have to feel the pain of losing her child. No matter the situation, it’s just too much to handle. Some moms are able to hang onto a piece of their child even when they’re gone, like this mom who hears her son’s heart in a transplant patient. While this doesn’t take away the pain, it eases some of the grief to know that your child is still around in some physical way and that, because of them, someone else is able to live each day. For mothers whose children go into law enforcement or the military, it is always a fear that something could go wrong. These fields are dangerous by nature, and accidents can come at a high cost. This is something that one mother faced when her Army veteran and state trooper son was killed in a high-speed car chase. It was so devastating that she continued texting his phone number even after he was gone. For Ernestina Nunez, her soldier son’s death came when PTSD led him to commit suicide. He was Nunez’s only child, and his loss took away her meaning in life. 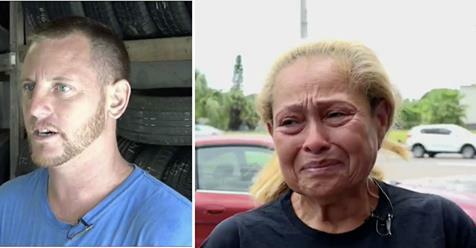 The high school custodian had lost all hope when auto repair shop owner Richard Newberry stepped in and did something absolutely amazing for the grieving mom.